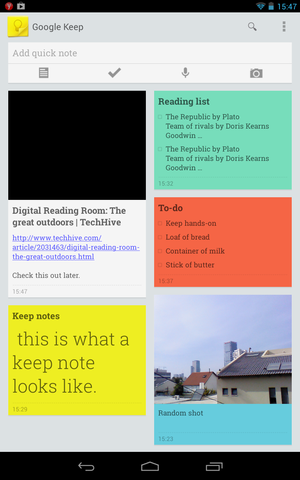 Hands on with Google Keep: Can it slay Evernote? Evernote who? Google is taking on the perennial digital note-taking favorite with Google Keep, a service that lets you store quick notes, checklists, Web links, and photos for things you need to remember or keep track of. Rumors of Keep first surfaced on Sunday after the service briefly went live for some users, but it wasn’t until Wednesday that Google officially introduced its Evernote challenger. Keep is currently available as an Android app for Android 4.0 (and up) users, and in your browser at drive.google.com/keep. Even though Google is offering a way to get at your notes from your PC, don’t be fooled into thinking this app was designed for both the desktop and mobile devices. 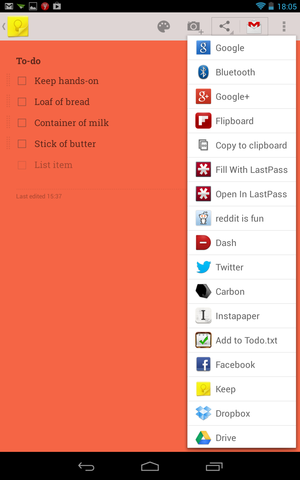 The current version of Keep is all about creating notes on your Android device and then accessing them from anywhere. You can certainly create new notes using Keep on the desktop, but the Web version for PCs comes with limitations the mobile version doesn’t have. That’s not to say Keep works fantastically well on Android, but the mobile app is far more developed than the current Web version. Google is billing Keep as a digital replacement for the swarm of sticky notes strewn across your desk, monitor, and refrigerator. The major digital advantage, of course, is that you can access your notes and reminders from anywhere you have Internet access since all your notes are synced to Google Drive. Once you’ve got the Android app installed, creating a note in Keep is straightforward. At the top of the screen you have an icon menu allowing you to create a text note, checklist, audio note, or snap a photo. One handy-dandy feature transcribes audio notes into text, with the original recording being embedded in the body of the note. Photo notes include a spot for adding text if you wish. You can also add a quick text note by tapping the “Add quick note” area above the menu icons. Each note can be color-coded by tapping the color palette icon when viewing notes in full screen. This can be helpful if you want to separate your to-do checklists from general reminders, or you just want to identify photo notes at a glance. There are currently eight colors to choose from, including basic white. Pro tip: If you change the color of your note when using the “Add quick note” option that will permanently change your notes’ default from white to the new color. Sharing to other Android apps with Keep. Android users can also share their notes with others by selecting the share icon inside a note while in full screen. Keep's sharing function works similarly to the general Android sharing options, allowing you to share notes using the apps installed on your device. I found sharing notes via the Gmail for Android app is especially useful. Checklists are shared as plain text, using brackets to stand in for check boxes, and photos are sent as standard attachments. Subject lines for shared emails are chosen automatically, using the title of your note. 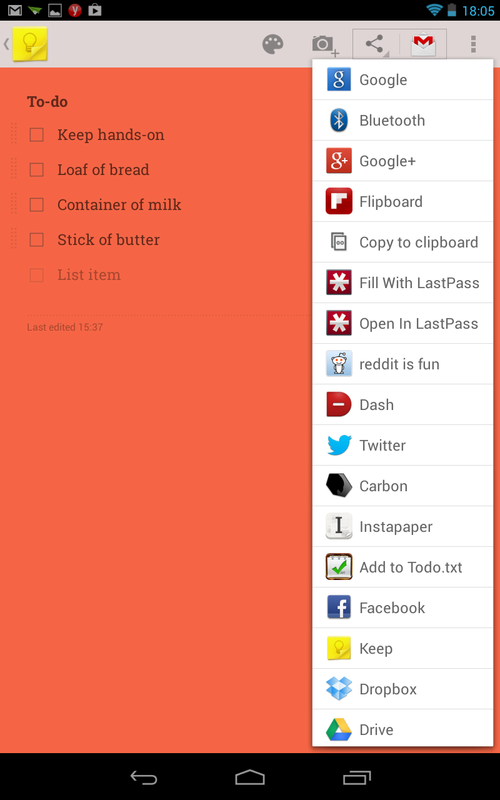 You can also add notes from other apps using Android's share options. That includes Chrome, which is helpful if you want to grab a Web page for later reading or just plain remember a site. Keep is clearly designed to create a Website preview when you grab a page from Chrome, but it doesn’t do a great job of that right now. The app is supposed to display the page’s headline and URL, and there is a large space for an image from the page. In my tests, however, Keep failed to display an image for any of my saved pages from multiple sites, including TechHive, The New York Times, and ABC.com. Keep may be a little rough around the edges on Android, but the mobile version is far more refined than the Web interface. For starters, even though Keep saves your notes in Drive, the service is not yet integrated into the Drive menu, meaning there are no quick links or shortcuts to get to Keep from Drive. Instead, you have to manually type in the URL, drive.google.com/keep. Google Keep on the Web. Similar to the Android app, the Web version lets you view your notes in a grid or single-column view. You can also type in new text notes, create checklists, upload images, search, delete, archive and view archived notes. Beyond the basics, however, there are a few obvious features that are lacking. If you grab a URL from a news story on your PC, Keep doesn’t create a preview of the Webpage and saves the URL as plain text—it can’t even create a link. You can upload images from the desktop, but there’s no option to use your Webcam to take an image. Grabbing a quick Webcam image of a receipt or product you want to remember is a very useful option in the Evernote desktop app. It’s a shame Google didn’t work a little HTML5 magic to include this option on its Web-based version of Keep. If you don’t have an Android 4.0 device, you could try using the Web version Keep on your device, but I wouldn’t recommend it. Keep on the Web did not perform well in my tests using a Nexus 7 running Android 4.2.2. One-finger scrolling was very laggy, as was typing in a new note, making it almost unusable. Anyone who uses Drive to keep all their content and isn’t yet using an application for keeping miscellaneous notes may be very happy—or at least content—with Keep. If you are a dedicated note-taker, however, Keep's flaws will send you scuttling back to Evernote in short order.